In the fall of 2018 UNU-WIDER welcomed 11 doctoral students from around the world as part of our PhD Fellowship Programme. The students, from Ghana, India, Malaysia, Brazil, Ethiopia and Kenya, came to UNU-WIDER for three months to work on their research under the guidance of a UNU-WIDER researcher as their mentor. Where I grew up in Pune, India, caste was a reality in even the most progressive of settings, particularly in college where caste-based quotas were in operation. This created a real ‘Us vs Them’ mentality which affected interactions between those from more privileged castes and those from historically disadvantaged castes. Growing up seeing the effects of this division is what helped steer me to this area of study. Previously I was studying the effects of technology adoption in agriculture on religious conflict in India, but my research has now moved to the effects of intergroup interaction. My PhD advisor suggested I apply for the UNU-WIDER PhD Fellowship programme. After reading about it online I immediately became really excited about the opportunity it could provide to discuss my research with scholars from multiple disciplines. My research interests, and my PhD topic, lie at the intersection of economics, politics and sociology, and it can be hard to combine these in any one methodology for research, but I had a sense that UNU-WIDER could be a good place for me to find other like-minded researchers and get some constructive feedback on my work. I was also keen on networking with other PhD scholars to see what collaboration opportunities there could be. Plus, having lived in warm places for most of my life, I will not deny the lure of cooling off in Helsinki as an additional incentive for applying! The research I did while at UNU-WIDER concentrated on understanding whether mixing with members of a different social group reduces an individual’s discriminatory attitudes. In 2013 Pune, India, there was a public housing scheme where apartments were randomly assigned. Now I’m studying how the effect of this ‘forced socialization’ might either make a person more isolated, or if it could make them more open to other groups, resulting in reduced discriminatory attitudes. Unfortunately, caste-based violence has been steadily rising in India, with the higher order castes now feeling threatened by the quotas given to lower castes (read more here and here). I chanced upon studies in the US and UK which explored how interactions between people of different races and ethnicities largely reduced prejudice and that got me thinking, what if the same methodology could be used to study caste-based interaction in India. My hope is that through my research I can make a difference and reduce caste-based violence and division. I feel that the best way I can do that is through influencing people in positions of power, and the best way I can do that is through focusing on policy-oriented research. My time at UNU-WIDER helped to cement that for me. Being at an institute that is so dedicated to creating research-based policy advice and working with in-country partners to implement it is pretty inspiring. During my time at UNU-WIDER I was also invited to present my previous work, on the effect of technology in agriculture on religious conflict in India, at the 14th Annual Households in Conflict Network (HiCN) Workshop at Medellin, Colombia. I was so pleased to have the WIDER network around to help me prepare — special thanks to Pia, Rachel and Omar for that! 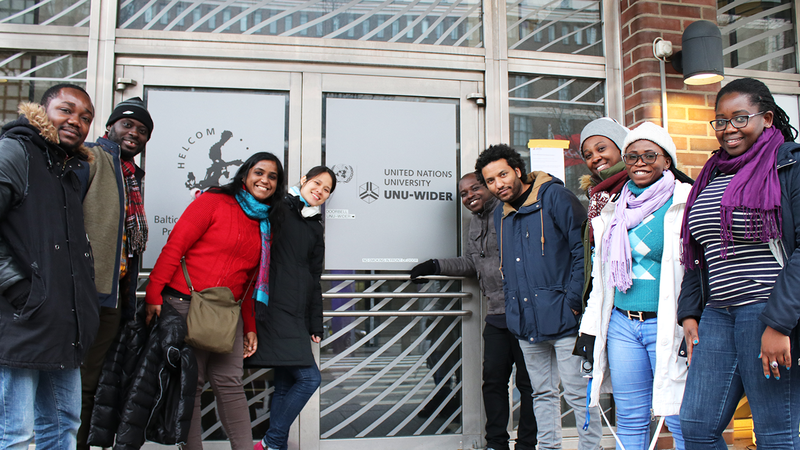 The entire experience at UNU-WIDER was very enriching. My mentor and other research staff provided so many insights on my research and it was a pleasure to work with them. And the WIDER Seminar Series, where I had the chance to present my current work on inter-caste interactions, provided me with useful feedback on my methodology. An unexpected highlight for me was the friendships I developed with the other PhD fellows. We became a close-knit group and did something together most weekends. We travelled to Stockholm and Tallinn, and explored Helsinki together, making for some fantastic memories to take home. We became close friends and I believe I will stay friends with many of them for years to come! Professionally, one of the highlights for me was attending the Think Development – Think WIDER conference. Being there and hearing about exciting new research in development economics, meeting both veteran and upcoming scholars from different disciplines and different parts of the world was extremely productive and fruitful. Plus, I met, and had a photo taken with Joseph Stiglitz!